NATURAL HABITAT AND PREFERRED SITE: Carolina buckthorn likes growing in the bottom lands, lowlands of east and southeast Texas and south central Texas as far west as the Pecos River. Seems to do well in either acid or alkaline soil in full sun, partial shade or even fairly heavy shade. Carolina buckthorn has been found in all of the woody areas of Texas. It adapts easily in the landscape to sandy or clay soils. IDENTIFICATION INFORMATION: Carolina buckthorn is a bushy shrub or small tree with large glossy leaves and yellow to orange fall color. It has decorative berries in the late summer through fall. FLOWERS AND FRUIT: The flowers are small and inconspicuous blooming in late spring to early summer usually May to June. The fruits are red berries that form in late summer ripening to blue black in the fall and winter. Each fruit contains two seeds about a quarter of an inch long. BARK: Gray-brown sometimes black, usually smooth but developing shallow furrows with age. FOLIAGE: The leaves are simple, alternate, scattered along the branches, large and medium green in the summer. Fall color ranges from yellow to orange. Length will vary from 2 to 6 inches. 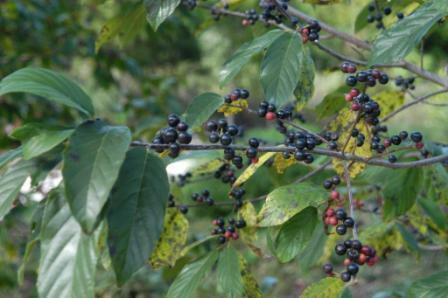 CULTURE: Carolina buckthorn is an easy to grow and seems to adapt to most conditions except for extremely wet soils. Does very well in rocky, calcarious soils and is quite drought tolerant. Needs very little fertilizer but responds well to the organic program. PROBLEMS: Very few if any unless completely over watered or never watered when planted in full sun. PROPAGATION: Carolina buckthorn can be grown from seed or cuttings. Fresh seeds can be planted without any pretreatment. Stored seeds should be kept at approximately 41 degrees for about 30 days. Germination normally happens in about five weeks. Seedlings are rapid growing. Semi hardwood cuttings taken mid summer through fall root fairly well. Cuttings should be 6 to 8 inches long and kept under a mist system or in a humid environment. As with all cuttings the lower half of the leaves should be removed. Rooting will normally happen within five weeks. Another time to take the cuttings is late winter just before bud break. INSIGHT: The fruit is attractive to several bird species. Leaves and bark are browsed by deer. Carolina buckthorn is an ornamental sized tree that should be used considerably more.